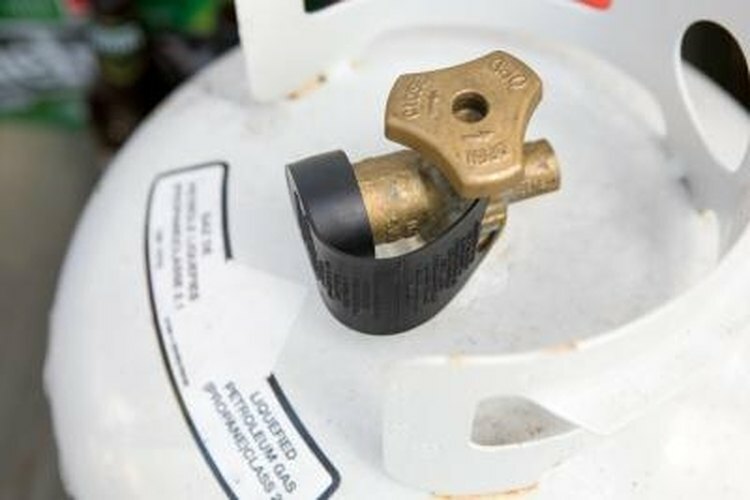 Propane tanks only need to be purged for three reasons: the tank is new; you have updated the valve on your tank; or you opened the valve on an older tank. Tanks need to be purged because air has somehow entered the tank. Air contains moisture, which is not a good combination with propane. When new tanks are transported, they are purposely loaded with air to help maintain the correct balance of pressure when shipping over various altitudes. Connect the two tanks. The purge kit comes with a portable cylinder to connect to the new propane tank. The purge kit also has a connection line with a regulator, a two-way purge valve, and a bleed port. Turn the purge valve to "Purge." Open the valve on the new propane tank. Open the bleed port. Opening the bleed port allows excess air from the new tank to purge out. Open the portable cylinder's valve. Turn the purge valve to "Charge." This will allow propane into the new propane tank. Wait for the flow of propane to stop. Repeat Steps 2 through 7 four times.